Police in India say a woman has burned to death on her husband's funeral pyre, committing the outlawed Hindu practice of "sati". The incident took place on Monday in Tuslipar village in the central state of Madhya Pradesh. Sati, or the practice of a widow immolating herself on her husband's funeral pyre, is believed to have originated 700 years ago. The rare practice mostly happens in parts of northern and central India. Senior Madhya Pradesh police official Shahid Absar told the BBC that the woman, Janakrani, burnt to death on the funeral pyre of her husband Prem Narayan in Sagar district. One report said she was in her 40s. 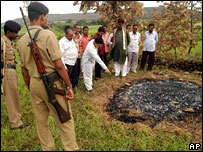 Mr Absar said Janakrani had jumped into the fire when her husband's body was being cremated according to Hindu rites. The police said early investigations had revealed Janakrani had not been forced or prompted by anybody to commit the act. Villagers say Prem Narayan died on Monday morning. His body was set alight by his family and villagers, after which people left for home. They say Janakrani left her house after returning from the cremation telling people she had to attend to some work. When villagers went looking for her they found her dead on the pyre, they said. Cases of sati are very rare in India. The last incident, involving a 65-year-old woman, took place in Madhya Pradesh in 2002. The most high-profile sati incident was in Rajasthan in 1987 when 18-year-old Roop Kanwar was burned to death. The case sparked national and international outrage. Police charged Roop Kanwar's father-in-law and brother-in-law with forcing her to sit on the pyre with her husband's body, but the two men were acquitted by an Indian court in October 1996. The Rajput women burnt themselves after their men were defeated in battles to avoid being taken by the victors. But it came to be seen as a measure of wifely devotion in later years. The custom was outlawed by India's British rulers in 1829 following demands by Indian reformers.